This little church is situated half a mile west of the pre-Norman Turret Castle (attributed to Earl Harald Hardrada) and a quarter mile south of the later Norman castle. This suggests it is on the site of an earlier Saxon church in the vicinity of Maesdref, a Saxon village serving the Welsh Commote of Llythfyneg whose Eastern boundary was Offa's Dyke. The Church from the south side. The square Bell Tower was added in the 17th Century and has two bells. The building is reputed to have been erected as part of the penance of one of the murderers of Thomas à Becket in 1170. The Archbishop was soon acclaimed for great piety, saintliness and righteousness and was canonised in 1173. He was reinterred in a shrine in Canterbury Cathedral in 1220 on July 18th. This date was then given for Huntington's three day Fair when granted by Henry III to Humphrey de Bohun in 1256. This fair remained one of the most important country fairs until recent years. For various reasons the township of Huntington failed to grow, several of the Lords were killed, trade moved to Kington and the Castle fell to ruin. The oldest part of the church is the north wall, dated early thirteenth century. The building was enlarged about 100 years later by the addition of the present Chancel with its east window of two lancets and later in the fourteenth century a window was added in the north wall. In 1397 and again a little later, there is mention of a Chaplain in Huntington living in a room in the Norman Castle, but in the early years of the reign of Henry IV the Church was held with the living of Kington and it has remained so ever since. At the time of the Reformation in the reign of Henry VIII, a proclamation was made that Becket's death was "Untruely called martyrdom." He was decanonised and then referred to only as Bishop Becket. Nearly all the churches dedicated to him were dedicated to other saints, but for some reason this did not happen here. There are only four churches now dedicated to St. Thomas of Canterbury. In 1536 a large tract of land west of Offa's Dyke was incorporated into England by the redrawing of the borderline between England and Wales thereby turning many Welsh men and women into English men and women in a quite artificial manner. After the Reformation and the issue of the new Prayer Book, some architectural changes were needed. Emphasis on the systematic reading of the scriptures and the careful exposition of the sermon required more light. A new south window was inserted to give more light to the priest at the Altar and massive pews with roughly trefoil ends were installed in the nave. There are two Elizabethan silver chalices, without hallmarks. One has the letter H inscribed and on its paten is H1576. There is also a pewter wine flagon and a pewter Alms dish make in London. A sundial was erected on the south east corner of the church, dated 1639. The font is also probably contemporaneous although externally it appears to be 14th Century. It lacks the staple marks used to lock the font and the internal shape of the bowl appears to be much later. The square Bell Tower was added in the 17th Century and contains two bells. One was cast by John Palmer of Gloucester and has the name of Edward Vaughan, Churchwarden 1671. The second was cast by Isaac Hadley of Leominster in 1703. It was probably in the late 18 Century that the nave was given whitewashed walls and ceiling. The plaster was removed in 1892 at the last restoration. During that time the Ten Commandments, The Apostle's Creed and the Lord's Prayer were displayed on either side of the east window, which was of plain glass. There was no Chancel Screen and the focus was upon the pulpit on the south side next to the 14th century door. 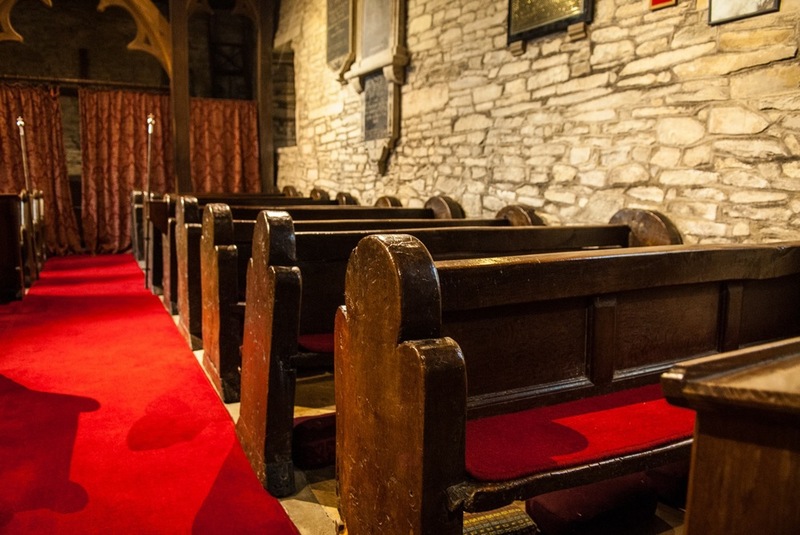 Box Pews for the more prosperous parishioners were on the Chancel side, facing the pulpit with backs to the Altar. Heating was provided by a free-standing stove whose chimney passed through the north wall. By 1890 the church had become dilapidated and largely from the generosity of the Lady Arabella Romilly of Huntington Park, it was extensively restored under the supervision of F. R. Kempson who designed and built numerous churches in Herefordshire and adjoining Welsh counties. The plaster was stripped from walls, ceiling and the exterior walls rebuilt and raised and the roof removed and rebuilt leaving the oak beams exposed inside. A porch was added to protect those entering the doorway. A new chancel screen was dedicated by the Bishop of Hereford in 1892. The waterborne heating system has been replaced by electric heaters as have the old oil lamps using the original shades and suspension chains. The coloured glass in the main windows is modern. On the north walls is a pewter replica of a Pilgrim's Token. A silver token was given to pilgrims who had visited the tomb of St. Thomas of Canterbury, which assured them hospitality in any monastic hostelry on their journey home.